Nice to meet you! My name is Diana. 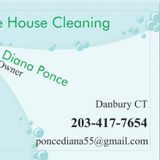 I enjoy kitchen cleaning, live in Bethel and want the opportunity to provide cleaning services for your home. I look forward to speaking with you! Hii, My name is a Trustworthy Housekeeping Very sweet,energetic outgoing, self-motivated and honest.